You are welcomed by Mike and Jen to High Oatfield offering quality Isle of Mull bed and breakfast. Perfect for a pleasant and relaxing holiday with a Green ethos approach. Watch Sea Eagles, Hen Harriers, Hares and Stags from your bedroom window. Our Bed and Breakfast is tucked away off the Craignure – Fionnphort road just outside Lochdon on the Isle of Mull. Centrally located giving easy access to Tobermory, Calgary and Dervaig 30 – 50 minutes drive and Bunessan, Fionnphort and Iona 60 minutes. Our Mull Bed and Breakfast is strictly non-smoking. We have our own dogs so cannot accept pets (we will allow assistance dogs). We are sorry but we do not have the facilities to accommodate children. Follow us now on our FaceBook page “High Oatfield B & B” and on Twitter “@HighOatfield_BB”. SORRY BUT WE NO LONGER ACCEPT ONE NIGHT BOOKINGS We have two en-suite double bedrooms with kingsize beds and memory foam mattresses, both are spacious, warm and comfortable. There is WiFi Broadband available and USB ports within plug sockets for charging cameras, phone and tablets. Both B & B rooms have freeview TV, hair dryer, tea & coffee making facilities and home baked biscuits or cake. To help plan your days out there are maps and books available and we can, with local knowledge offer advice on places to try to see wildlife. Guests are asked to remove outdoor shoes before going upstairs so we suggest alternative footwear for the bedrooms. We try to use organic products and offer a wide choice on your continental breakfast menu of cereal, juice, yogurts, homemade bread and preserves, organic eggs and fruit. Breakfast is delivered to your room each morning. Dietary requirements can be catered for with prior notice. Tea and coffee on the complimentary room trays are organically sourced. We offer packed lunches so you can head off for the day without worrying about having to find something to eat, sample Breakfast and packed lunch Menu . To enable us to service your room every morning we ask for access to your room from 10 am please. 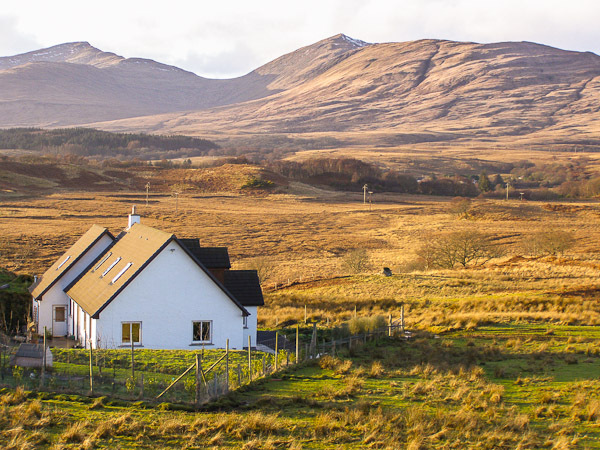 See our 2019 Bed and Breakfast Prices , to discuss your Isle of Mull Bed and Breakfast requirements please contact us on 07884 492192 or 07733 83048 or the contact form. See our Bed and Breakfast accommodation photo gallery and read our Bed and Breakfast Guest Comments for further information.